Despite being one of the most translated and versioned books in history, Sunzi's Art of War is still, today, wrapped in a halo of mystery and ignorance. Daniel Tubau has done a monumental research work to offer us a complete vision of the great classic of Chinese strategy that allows us to understand its content, discover its origin, find out who was its author and when he lived, as well as understand its true intention and meaning. Tubau shows that The Art of War, against many common interpretations, is a book of many fascinating readings. We will discover what place this classic occupies among the treaties of military strategy, whether it was used by Napoleon, the First Chinese Emperor or Mao Zedong, if the art of war is, paradoxically enough, an art of weakness, which employs techniques traditionally considered as "feminine", what role divination and calculation play, the importance of deception and the use of spies, the role that the general or supreme strategist must play in war, and adaptation to changing or unforeseen circumstances. We will also understand the reasons that have made it be used as a fundamental textbook in military schools, but also that it has become a manual for executives, businessmen or politicians and that its advice applies to almost any area of social life. 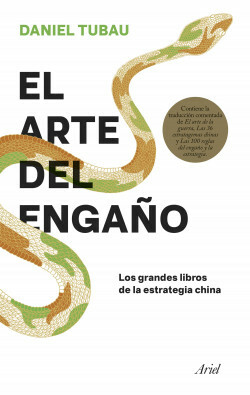 The book includes a complete translation of the great classics of strategy The Art of War, The 36 Chinese Stratagems and The 100 Rules of Deception and Strategy, with accompanying commentaries that will help the reader, even the least versed, to understand it in all its depth. All this in an exquisite presentation, with maps, illustrations of Chinese battles and the strategies used, as well as the weapons of the time and the methods of attack and defense, an indispensable complement to understand the most complex aspects of the art of war. A careful edition that offers the most complete overview of the art of Chinese strategy published to date.